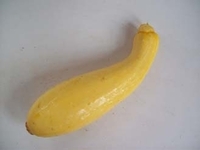 Zucchini is a summer squash that, like all squashes, descended from native related species originating in South America but is believed to have been developed in Italy. Zucchini has been popularized throughout North America most likely by Italian immigrants, their descendants, and their famous cuisine. Summer squash is approximately 94% water, very low in calories, and a great source of vitamin A, C, potassium, and calcium. Zucchini dehydrates quickly. Store in plastic bag in hydrator drawer of the refrigerator for up to one week. Damaged or bruised zucchini will deteriorate very quickly. Cooked, pureed zucchini can be frozen in airtight containers for a great winter soup. You can also grate zucchini and freeze for use in breads and muffins.